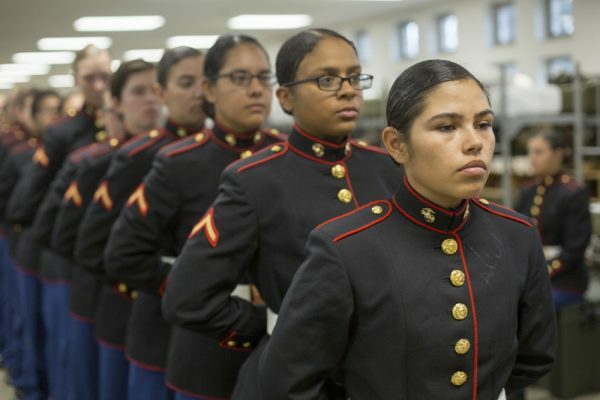 A company of Marines became the first to graduate in the service’s new female blue dress uniforms Friday at Marine Corps Recruit Depot Parris Island, S.C.
Marines from November Company, 4th Recruit Training Battalion marched in newly approved outfits that include mandarin collars, white belts and gold waist plates, a Marine Corps statement said. The new coats resemble those worn by male Marines but lack pockets and lines on the uniform. Female Marines had complained that their old coats weren’t being recognized as belonging to the Marines because civilians were more familiar with the male versions, Mary Boyt, a member of the Marine Corps Uniform Board, said in the statement. Another November Company drill instructor, unit historian Staff Sgt. Kara Sykes, said the new uniform is a throwback to older World War II-era outfits. The new coat will be phased in over the next several years and become mandatory in October 2022.